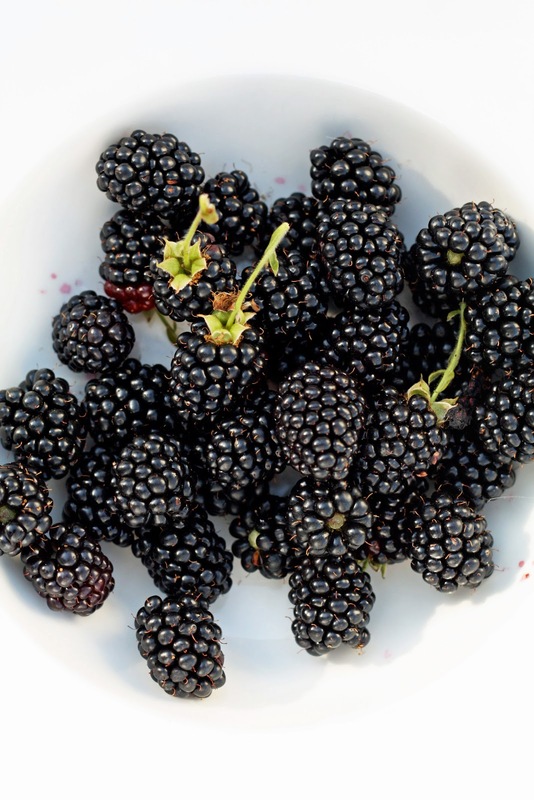 I love blackberries, but the ones I savor most are those that we pick right outside our door. There's something about wandering out through the patio in your pajamas with an empty bowl in hand, and coming in with fresh, morning chilled fruit to begin the day, that makes them extra sweet. We've had a bumper crop this year. We've been picking for over a week now, and as you can see, there are plenty of pink berries continuing to ripen. Best wishes on enjoying yet one more of the seasons of bounty in late summer. 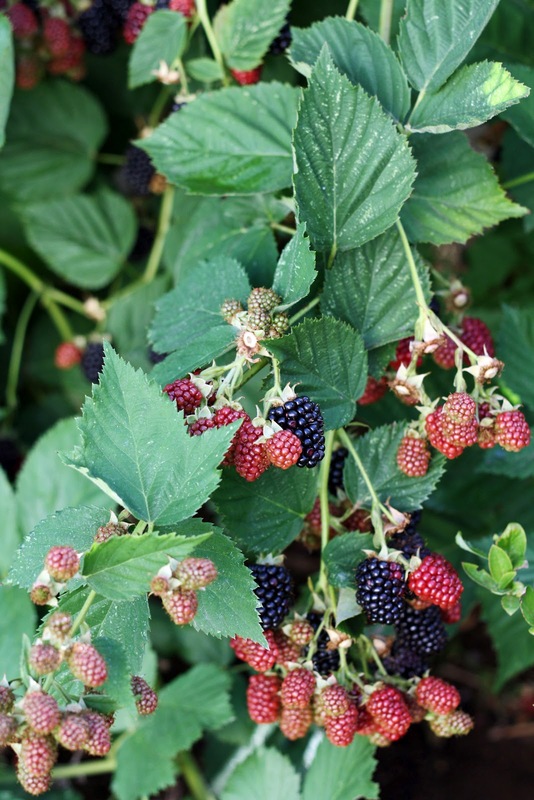 Do you grow a thornless variety? We have some at our farm property, but those thorns are vicious! I would love to find a tasty thornless variety. These look like such a delicious, plump sort. We only have the wild ones here, which are delicious, but small. Wow those look great! Hope your having a great week! Trina I love the new look of your blog. Especially the scripted font. How lovely! I wouldn't even know how to do that. I have trouble outlining things in word. Hee Hee. There are a thornless variety - it's so nice! Každý rok jich mívám kolem 20 kg. Letos v květnu mi vše pomrzlo. Škoda. Hello there! I love the idea of wandering through the garden in my pajamas! However, the birds all ate our blueberries this year (even with a net on it). Do you have this problem with your berries? Do you have a secret rememdy? Please? If fruit has ever looked beautiful, those blackberries certainly do. They look soooo good . . . I have some great memories of picking wild blackberries in the Pacific Northwest. We brought them home to make pies and jam and sold the surplus in the next neighborhood over for 75 cents a bucket. The best undiscovered spot to pick was an abandoned airport just over the hill from the Nalley's potato chip and pickle plant. Such pretty berries! And the deer aren't eating them? I too love blackberries, but ours are not too ripe yet this year; we have had a rather cool summer here in northern California. Net your blueberries with a fine fruit netting or even small gauge bird cloth. It helps. Surprisingly, no critters have bothered the blackberries...shhh, maybe they haven't spotted them yet. Yum! The big kids found some wild ones here at the park. I always look forward to your posts. You have such a lovely family and I love your photography. Yummy! I love blackberries. You have such luck with the berries. My birds are berry fanatics. The blackberries look wonderful, but I really want to just to say thank you. Finding your blog was a happy accident. I went back and read your archives, and knowing a little about your challenging journey to parenthood, it's very special to see your children running around the house and garden. Since you don't post daily, it makes the updates that much more special. (That strawberry bathing suit! I die!) You've brought real beauty into my life, and into your other readers' lives, too.